The ivee Digit (Retail $49.99) and the ivee Flex (Retail $69.99) are voice-controlled alarm clocks that talk back to you. They’re completely programmable by simply stating “Hello ivee,” and then issuing a command. The smart little ivee will hear you, understand your speech, respond back to you, and then do your bidding. With her soothing British accent, and ability to understand your normal speaking voice, ivee will become your trusted bedside assistant for telling you the time, date, and indoor temperature, waking you up with an alarm, and putting you to sleep with ambient sounds. 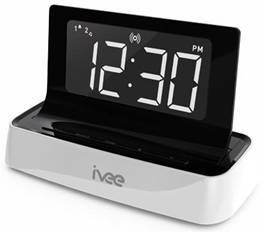 You’ll wonder why you ever bothered with a traditional alarm clock when you could have had an ivee. Both ivee models share many of the same excellent features, with a few exceptions. The ivee Digit has a 3” tall LCD display, 3 choices of alarm sounds, 3 different ambient sleep sounds, can understand 35 voice commands, and uses 3 AAA batteries as a backup power source. The ivee Flexhas a 5” tall LED display, 6 alarm sounds, 6 sleeps sounds, understands 45 voice commands, and has a CR2032 backup battery. The ivee Flex also comes with a digital FM radio inside which the ivee Digit does not. Both models are programmed with the same amazing voice detection technology, which allows you to program ivee and request to be given information with a few simple phrases. Every command must start with “Hello ivee” so that ivee knows you’re speaking to her. Since ivee is always listening for those key words, you needn’t ever touch a button, but if for some reason you don’t want to politely greet ivee before issuing instructions, you can also press down on the display screen to start the command function. You want to know the temperature? Just greet ivee by saying “Hello ivee.” She will respond with a selection of comments like “Hi,” or “Good evening, command please.” You say, “temperature,” and she will tell you the current indoor temp in either Celsius or Fahrenheit. The same can be done with time and date. You have the choice of a 12 or 24-hour time format, and can set the clock to Daylight Savings Time. There are 2 alarms that can be set, each with its own alarm sound. The backup batteries will ensure that even if there’s a power outage, your alarm will still go off. One of my favorite features is the ability to turn the alarm off by speaking. There’s something very satisfying about rolling over in bed and yelling “Alarm Off!” in the morning, and actually having your clock obey. You can go to sleep to a selection of calming ambient sounds that will lull you into a good night’s rest. When setting an alarm or sleep sound, ivee will play a sample of each for you to choose from. You may also wish to use the timer function, for such activities as exercising or cooking. You can set the timer from 1 minute up to 10 hours, and when it goes off you’ll hear a pleasant musical selection. The technology inside the ivee is actually very impressive. By using thousands of voices from all over North America in the development of their Natural Language Processor, ivee is able to understand many varying accents and types of diction. Wherever you’re from, you can speak in your regular voice and not have to worry about ivee misunderstanding your commands, even straight out of the box. There is no training time required for ivee to know your voice. This processor is also 5 times more powerful than others of it’s kind, so ivee will be quick to recognize and act on your instructions. When you speak, ivee will be able to filter out ambient noise from behind your speech, making it unnecessary for you to be in a quiet room for ivee to understand you. This is done by ivee recognizing the individual “phoneme” sounds that make up words, comparing them to a grammatical list, and deciding what is the most likely word that you’ve said. All of this is done in a matter of seconds and will never be evident to you as the user. It will feel like you are seamlessly talking to your efficient little assistant. Established in early 2011 by Jonathon Nostrant, ivee (or Interactive Voice), is a fairly new company, which I can see growing into a household name in years to come. It is very easy to use, and really fun as well. Due to her ability to recognize voice commands even when you’re not right next to her, ivee has already been recognized by the World Blind Union. She can be a useful aid as well as a super cool gadget to have at your bedside. 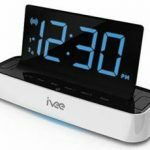 You wouldn’t think that an alarm clock could be a terribly exciting product, but ivee is a real pleasure to use, and I didn’t once run into any frustration with her voice recognition. This is a huge plus in ivee’s favor, as I have invariably found problems in any other products with voice recognition that I’ve tried out, even the major name brands. It was so nice to be put to sleep and woken up by pleasing sounds, to be able to communicate with ivee in my natural tone, and to have her respond to me in her polite and friendly voice. I’d recommend that anyone add either an ivee Digit or an ivee Flex to their lives, for fun, convenience, and the luxury of having a personal assistant constantly by your bedside. You can get an ivee of your very own by visiting www.helloivee.com, www.amazon.com, or dropping by your local Brookstone store.